And they are all wrong about Chimpanzees too. Who me? I wouldn’t do that! 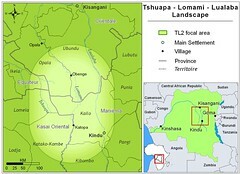 We knew from our observations in the Lomami forests and reports coming from further west that people kill and eat bonobos. Across the Congo River people kill and eat chimpanzees. But we had never heard of either chimpanzees or bonobos killing and eating each other. How could they? They don’t live in the same forests. No one has yet reported a population of bonobos on the right bank of the Congo or a population of chimpanzees on the left bank of the Congo. So I was truly surprised to read the Reuters report this week that said just that. It said “the researchers recorded over 10 instances when a group of the apes set out on hunting trips in search of chimpanzees”. The article was quite graphic: “the bonobos silently crept …trying to get underneath a group of chimps before clambering up a tree in a sudden attack, the researchers said.” The researchers who were supposedly being quoted were excellent scientists. I wrote to Gottfried Hohmann, one of authors of the Current Biology article being paraphrased, and asked if it was true that bonobos and chimpanzees coexisted somewhere and that the bonobos hunted the chimpanzees. He was as surprised as I had been and sent me the article on which the Reuters piece was based. Bonobos were previously known to hunt mammals BUT unlike chimpanzees were Not thought to hunt in groups and NOT thought to hunt monkeys. They observed five cases of monkey-hunting by bonobos at LuiKotale, the Max Planck research center in Salonga National Park. Three of these hunts resulted in a monkey kill. In all cases the hunting party consisted of both male and female bonobos, and both sexes took active part in the hunting. There was absolutely no mention in the article of bonobos and chimpanzees co-existing and consequently no possibility for bonobos to hunt chimpanzees, or vice versa. The reporting by Reuters was just plain false. Michael Kahn of Reuters is a science reporter and so he understands the disappointment researchers feel at such a mangled representation of their work. I also believe that such light popularization of an endangered species, already locally extinct in many areas through the bushmeat trade, is a disservice to bonobos when they need all media support possible. Update: on Oct. 23rd, a corrected version of the article was republished by Reuters, removing the instance where bonobos hunted chimps. This entry was written by Terese Hart, posted on 2008-10-16 at 12:00 am, filed under Bonobo. Bookmark the permalink. Follow any comments here with the RSS feed for this post. Post a comment or leave a trackback: Trackback URL. I knew there was something fishy about that story. Thanks for investigating and getting to the truth. Is there a way to get this corrected – to show what Reuters did is wrong? This can only hurt the bonobos unless it is corrected on the national stage. My own opinion of Reuters would certainly improve if they made an effort to correct the error publicly and if they made reference to the tenuous status of the bonobo in the wild. If Maury Povich were a chimpanzee, he’d love this drama: Until recently, no one could concretely identify the paternity of Beni, a baby chimpanzee in New Zealand’s Wellington Zoo. Sally, Beni’s mother, had always had a thing with handsome Sammy, but with all the male chimpanzees she consorted with, who could say who was Beni’s daddy? Still, modern science came to the rescue: DNA testing has confirmed that Sammy is indeed the father of baby Beni — despite the fact that he’s not the alpha male of the zoo’s troop. All of Wellington zoo’s chimps are part of the Australian Species Management Programme, a carefully managed breeding program meant to help ensure the genetic diversity of the endangered primate. Beni turned the big “1” this Wednesday. Speaking of great apes, last week we reported on a Reuters story asserting that bonobos, chimps’ also-endangered relatives, hunt and eat chimpanzees. One of our primate-loving readers has informed us that, according to bonobo conservation expert Dr. Terese Hart, bonobos can’t be killing and eating chimpanzees because the two species live across the Congo from each other and populations have never been seen on the wrong side of the river. Turns out Reuters got it wrong — but though Bonobos don’t hunt chimpanzees, researchers have observed a handful of monkey-hunting forays by bonobos in a Congo rainforest reserve. There’s a link to this site in the newsletter. I was very glad to see Center for Biological Diversity running the link to this rebuttal; I agree that being responsible when commenting or reporting on animal behaviour is extremely important. I had already told my son about the Reuter’s article (the day we went to visit the rainforest exhibit at the California Academy of Science in San Francisco)– I’ll be glad to now retract it, because he was very startled, as I’m sure we all were. Thank you, Sheryl ! And thank you Kate. And I KNOW that the authors of the misquoted Current Biology article, Martin and Gottfried, are glad to know that at least to some extent the Reuters mess-up is being righted! Somewhere in these articles I read a superior holier than thou condescending, remark to a logical question”are Bonobos closer to Humans than Chimps. Since anatomically they resemble human more so than Chimps. It would make be Scientifically correct, to answer with the analysis of the genetic stucture including the positioning of the DNA on each Chromosome, if you know. To have a PHD and makesuch a general statement, as many Doctors do, leads to a lot of disinformation. Actually I would suspect your answer is wrong, but maybe not, but am sure that the way you answered was not academically prudent. you are right. 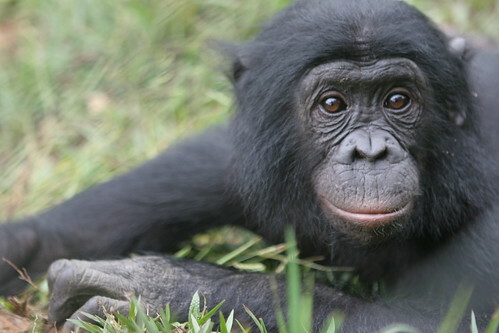 bonobos are NOT closer to humans than chimps– genetically. See page “the bonobo” Smiles. This is a great reference to a classic press goof. Can we conclude from the Reuters report that the bonobos must be building boats in order to cross the Congo River in order to engage in their ‘chimpanzee hunting safaris’? That would make a great movie!